The HTC Aria. The tiny phone with big potential is the second Android device on AT&T, and arguably the first worth really considering on the U.S. carrier. (Sorry, Moto Backflip.) 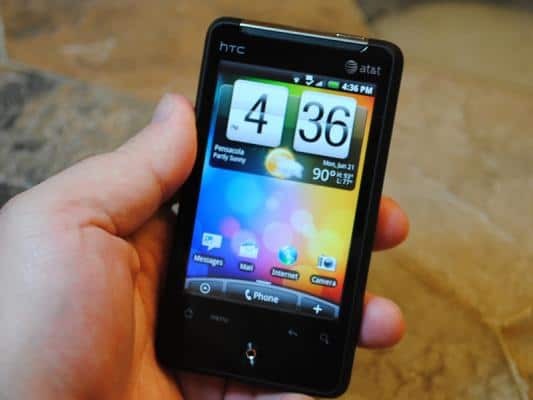 It has the slick HTC Sense on top of Android 2.1. And while this guy is small, it is mighty. You've watched our hands-on and unboxing. You've seen our benchmark results. Now it's time to review the Aria. After the break, people. After the break. No doubt about it, the HTC Aria is small. It's just about the smaller Android phone we've used. It's roughly the same size as the HTC Legend (read our review), though a tad shorter and without the chin. The phone itself measures in at 4.1 inches tall by 2.3 inches wide and 0.46 inches thick. Suffice it to say where phones like the Evo 4G, Motorola Droid X and Samsung Galaxy S push the limits of traditional phone size, the Aria returns to a kinder, more pocketable place. On the front of the phone you'll find the 3.2-inch capacitive TFT LCD touchscreen. (Remember the days when that size would have been big?) You've also got the four traditional Android buttons -- home, menu, back and search -- and the same optical trackpad and button as on the Verizon Droid Incredible. The volume rocker is on the left bezel, the power button and 3.5mm headset jack are up top, and the microUSB port, microphone hole and lanyard loop are on the bottom. Pretty standard stuff. The rear of the phone is made up entirely of the battery cover, which is coated in the soft-touch paint we've come to love. The 5-megapixel camera is tucked away in here, and four tri-wing screws are exposed -- a nice piece of design that gives a bit of an industrial feel to an otherwise small and cute phone. Note that there is no flash for the camera, with the space instead used for the speaker. Open the battery cover (pro tip: hold the cover and then press in on the speakerphone grill) and you're nearly blinded by the Ferrari-yellow paint scheme, which includes the battery. The bottom half of the inside is topped by clear yellow plastic, which let's you see into the cuts a bit. Fun fact: There are two metal contacts on the bottom left that are used to turn the back cover of the phone into an antenna. By now, those of you familiar with Windows Mobile should be screaming "This is the HD Mini that you guys saw at Mobile World Congress!" And you're right. It is. Save for the buttons on the front and radio frequencies, the specs are identical, inside and out, all the way down to the yellow paint. The bottom line -- for basic tasks, the Aria flies. Tooling around the operating system and Sense UI -- scrolling through the application launcher, e-mails, etc. -- is so fast, you'll think it has one of those newfangled 1GHz Snapdragon processors all the kids are raving about. But the Aria's processor is a "mere" 600MHz. It's just another example of how megahertz aren't everything. Helping things along are 512MB of ROM and 384MB of RAM (both before the OS is counted). The Aria sports a 1200mAh battery. The good news is that because it's not powering a huge screen, it should last you a little longer than, say, the battery on the Evo 4G. The bad news is that something is still chewing through the battery faster than we'd like. You likely won't be playing games all day on the smaller screen, so you'll probably get through a full day. Best tip we can give you is to decide what services you want updated -- e-mail, Facebook, etc. -- and then shut off everything else. The Aria runs Android 2.1 with HTC Sense on top of it. It's the fourth Sense UI phone that we've reviewed this year, and there are no real differences between Sense on the Aria and Sense on theHTC Legend, Droid Incredible or Evo 4G. For more on Sense, read any of those reviews, or read our Sense UI preview. You can NOT turn off the Sense launcher like you can on the Evo 4G. Let's move on to the elephant in the room. A lot has been made about AT&T locking down its other Android phone -- the Motorola Backflip -- so that it can only download and install applications from the Android Market. Same goes with the HTC Aria. For a good number of people, that's not going to be a big deal, and you're never going to want to sideload an app. But here's where it hits home: You know that Swype keyboard that's all the rage these days? Forget about it on the Aria. Only way you can sideload apps is to install them through the SDK. If you know how to do that, chances are you'll be just fine. For everybody else, you're stuck in the Market. And that's not a totally bad thing. You still have access to tens of thousands of apps. It's just an annoyance, and an unnecessary one. No other carrier blocks apps from outside the Market, and it's another back eye for AT&T. It's not a big enough deal for us to tell you not to buy the Aria, but it's something you need to be aware of. -	AT&T FamilyMap: "Conveniently locate a family member's wireless phone on a map from your mobile phone or PC." -	AT&T Hot Spots: Find AT&T Wifi hotspots. -	AT&T Maps: An alternative to Google Maps, powered by Telenav. -	AT&T Navigation: Turn-by-turn navigation and directions, powered by Telenav. -	AT&T Radio: Internet radio powered by mSpot. -	Mobile video (based off the old Cingular Video). One thing that's missing that you'll find other new (and larger) Android phones are live wallpapers. We'd expected them to be hacked on anytime now. But they're missing from the stock device. The Aria is a competent little shooter, with a 5-megapixel camera strapped to its back. The autofocus is as snappy as usual on a smartphone. You'll do better in good light (naturally), and you're pretty much dead in the water in the dark, as the Aria does not have a flash. Video also is on par for a smartphone camera. It shoots in VGA resolution (640x480), and colors are a bit washed out. The microphone is pretty hot, as you can hear in the example below. -	Phone calls: Yep, the Aria's a phone, too. The speaker is plenty loud, and the phone works without hesitation. -	GPS: Seamless. Connects without a hitch, and isn't locked down, meaning you can use any GPS-enabled app with it. -	Bluetooth and Wifi: Nary a problem connecting, or keeping a connection. -	Speakerphone: It's louder than the Nexus One, and not as loud as the Evo 4G, whcih seems to resonate through its giant body. -	E-mail: POP3, IMAP, Exchange, gmail -- it's all available to you. -	Keyboard: The Aria uses HTC's custom keyboard, which we like a lot. It's a little cramped on the smaller screen, though. All in all, the Aria's a solid little phone, and it's probably the best Android device on AT&T, at least until the Samsung Captivate is released. But that's a high-end phone. For the money -- we're seeing the Aria sold for as little as, well, free on contract -- it's a decent beginner Android phone. The issue with only being able to load apps from the Android Market is pretty embarrassing, but it's not a knock against the phone itself. HTC has done its usual stellar job with the hardware, its Sense interface is as fast as we've ever seen it, and there's no reason this phone shouldn't get the Android 2.2 update. Size may be an issue. If you have large hands, you're likely going to want to look elsewhere. For our money, we'd just buy this feller off-contract, as AT&T has it listed for $380. That way you're not tied into a two-year contract on a phone that's nice, but not exactly high-end. But if you're looking for a pocketable phone with all the bells and whistles Android has to offer, the Aria's a nice, economical bet.